continued in Your Name in Lights. Rorie and Cecily were friends turned star-crossed lovers during their senior year in college. Driven apart by secrets and the demands of Cecily’s powerful political family, neither could ever get over the memory of the life they’d planned to share. Reunited half a lifetime later in a small community theater in Connecticut, the sparks between them were quickly rekindled, but they had to overcome the ghosts of their past before they could embark on a new future together. After a leap of faith, their lives took a dramatic turn and they had to learn to navigate the dual pressures of fame and family under the bright lights of Hollywood. In this final book of the Love’s Encore trilogy, Rorie and Cecily are just settling down and looking forward to a quiet and predictable life together when unexpected news changes the course of their future forever. Can the twists and turns of fate finally lead to a happy ending? 4.0 out of 5 starsFifty Percent Illusion but one hundred percent captivating story. This book completes the Loves Encore series about Rorie and Cecily. However before we have our happy ending, this pair face some life altering challenges. Just as life was settling into a nice comfortable pattern, Rories past comes crashing into her present day life and Cecily has some dramatic changes in her work life that could have dire consequences for her relationship. Can these two women be honest with themselves and their partner to truely be happy or will it all come crashing down? Read this wonderful story by Ms MacLeod to find out, you won't be disappointed. The characters developed wonderful personalities throughout the three books. I felt as if I personally knew Rorie and Cecily. I learned so much about theater productions and set designing. It was obvious that Miranda had researched her character's professions. From college days to married with children, I enjoyed Rorie and Cecily's journey. 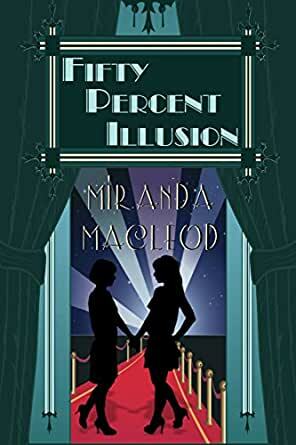 I look forward to many more well-written books by Miranda Macleod. With each book this story just keeps getting and better and this one is beyond great!!! Love these characters and the hilarity and drama will keep you glued to the pages, not to mention chapter eight which had me rolling off the couch with laughter!!!!! Thank-You, so much!!! 3.0 out of 5 starsEditing is important. Enjoyed the series but the first thing i noticed was the change of Brad's last name to "Paisley". Not a huge deal in the grand scheme of things but if a book is going to be published, it needs to be checked for errors! Pretty much your average wrap up and HEA. Though it is a bit cliche, it's still a satisfying conclusion for Rorie and Cecily. Another solid book by MacLeod.